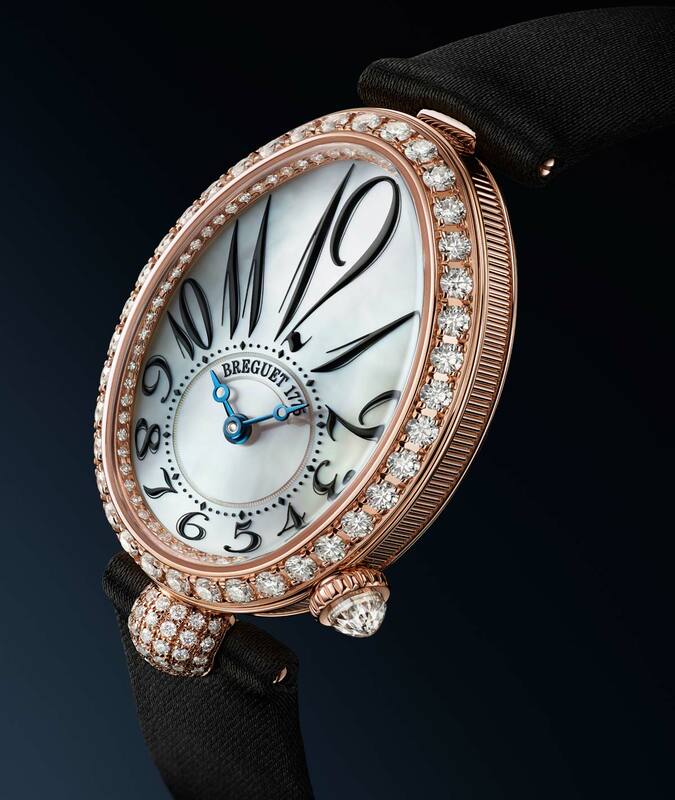 Breguet's Reine de Naples collection is inspired by an early bracelet watch that Abraham-Louis Breguet created for Bonaparte's sister Caroline, Queen of Naples. With its unique ovoid case, this watch has become one of Breguet’s bestsellers as well as a symbol of feminine refinement. 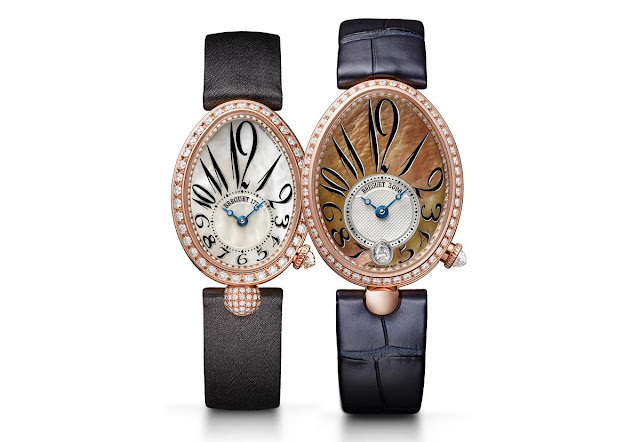 This year, Breguet is revisiting the Reine de Naples Reference 8918 model, characterized by large Breguet numerals standing out against a background crafted from a Tahitian mother-of-pearl and framing the engine turned dial offset at 6 o’clock with Breguet open-tipped hands in blued steel. At 6 o’clock, the sparkle of a pear-shaped diamond. The cambered ovoid case with delicately fluted caseband is made in rose gold and set with with 117 brilliant-cut diamonds (approx. 0.99 ct) on the bezel and flange, as well as a briolette cut diamond on the crown. Size is 36.5 x 28.45mm and water resistance 3 bar (30 metres / 100 feet). Powered by the mechanical self-winding movement Calibre 537/3 with a 45-hour power reserve, the new Reine de Naples 8918 comes in two versions: one with a midnight blue satin-finish leather strap and the other with a chain bracelet that closely resembles a supple rose gold ribbon. This year also sees new additions to the Reine de Naples Mini Reference 8928 line, now available in six additional variations for a total of twenty different versions. The famous mother-of-pearl dial and its off-centred 6 o’clock chapter ring remain the principal characteristics of this model, alongside its dainty 33 mm x 24.95 mm size. The chapter ring is now graced with generously-sized graphic Arabic numerals designed to match the case shape. 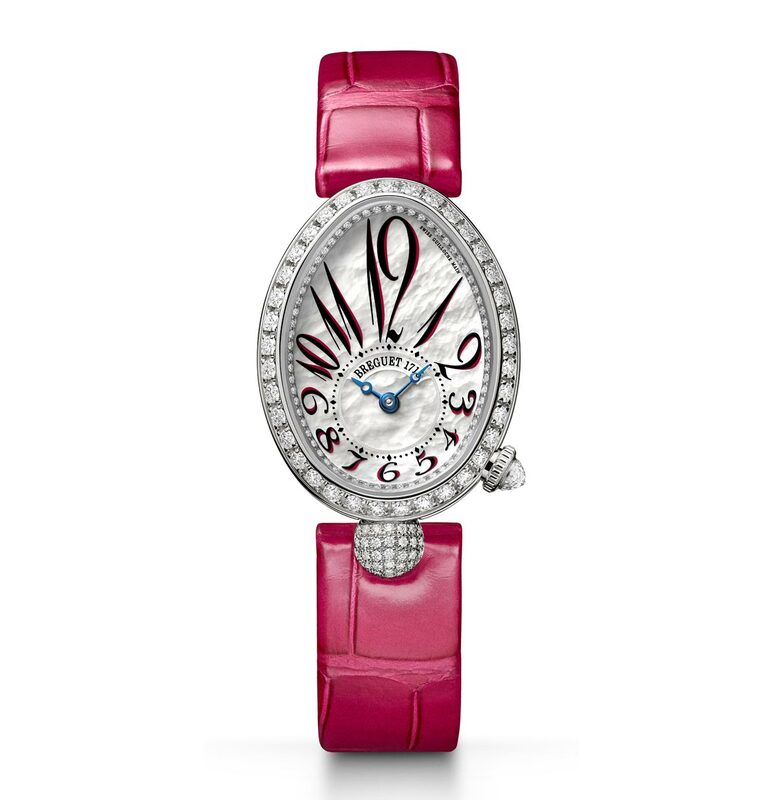 The six references unveiled this year pick up the aesthetic codes of the Reine de Naples collection, including the "ball-type" lug – in this instance paved with diamonds – as well as a winding crown topped with a briolette-cut diamond at 4 o’clock. 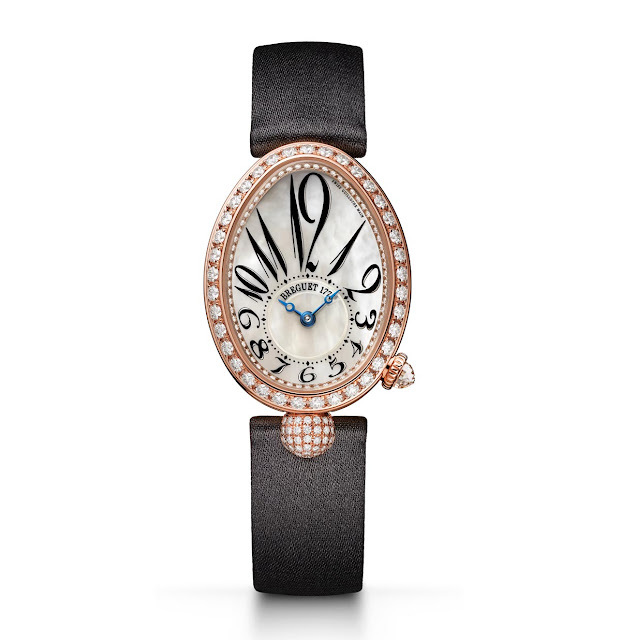 The bezel, flange and folding clasp in gold are finely set with brilliant-cut diamonds. Continuing the tradition of equipping Breguet ladies’ watches with exclusively mechanical self-winding movements, the new Reine de Naples Mini houses Calibre 586/1 with a silicon balance spring. It has a 38-hour power reserve and beats at a frequency of 3 Hz (21,600 vibrations per hour). Baselworld 2017: Breguet Reine de Naples Ref. 8918 and Reine de Naples Mini Ref. 8928. Breguet's Reine de Naples collection is inspired by an early bracelet watch that Abraham-Louis Breguet created for Bonaparte's sister Caroline, Queen of Naples. 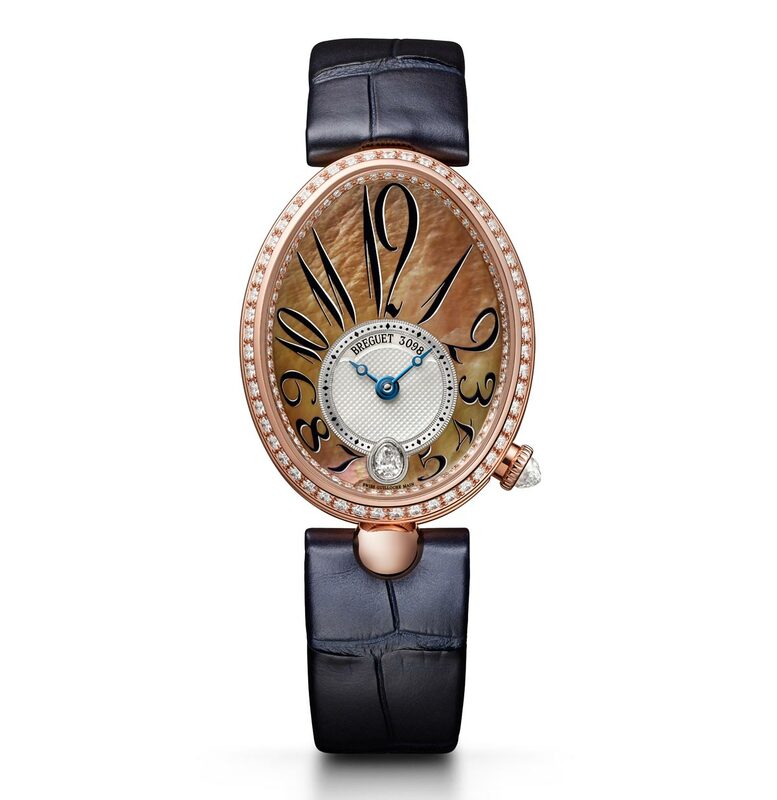 With its unique ovoid case, this watch has become one of Breguet’s bestsellers as well as a symbol of feminine refinement. 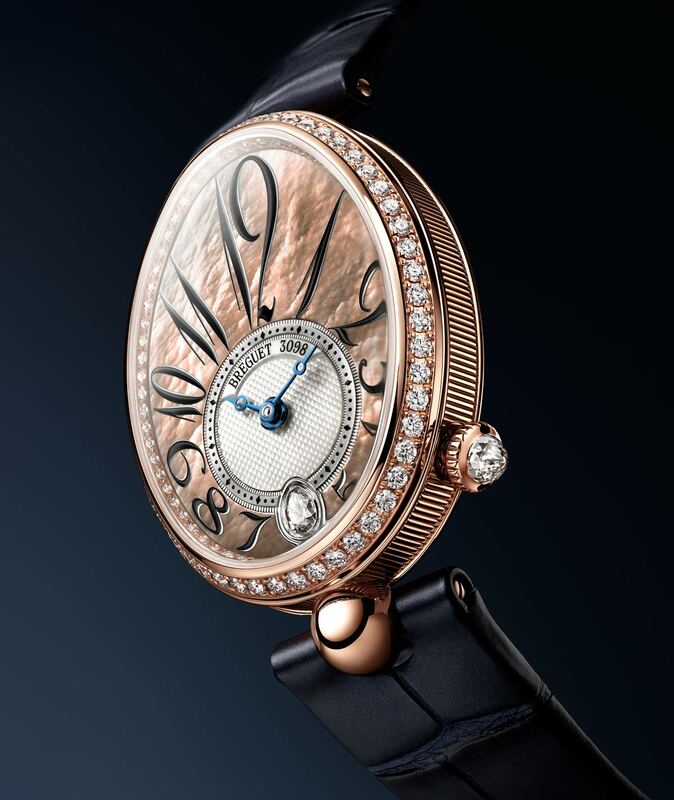 This year, Breguet is revisiting the Reine de Naples Reference 8918 model, characterized by large Breguet numerals standing our against a background crafted from a Tahitian mother-of-pearl. 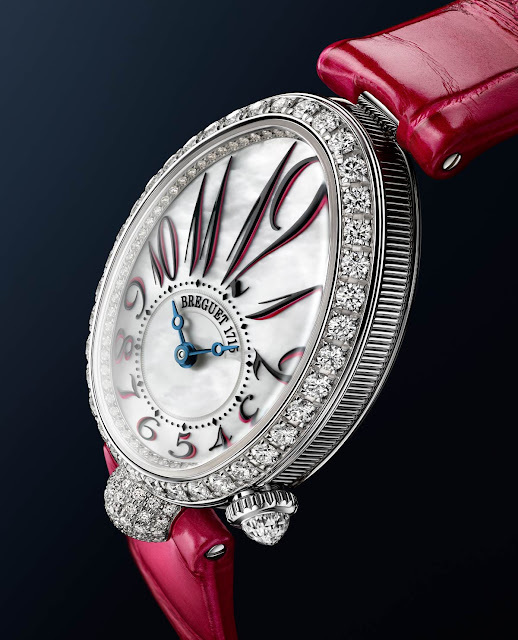 This year also sees new additions to the Reine de Naples Mini Reference 8928 line. Breguet novelties 2017.